I came home, after a two week visit with my daughter in the UK, to an astounding sight ……………..
…………………. my herb garden had turned into an herb jungle! Before I left, I had been trying to constrain myself, as the herbs were young and tender and didn’t really appreciate my herbaceous gusto. You see, I love to use fresh herbs quite liberally, not only in my cooking, but as garnishes to make my food look fresh and appealing. I’m happy to say this restraint issue is not a problem anymore – after two weeks of my absense, these fragrant, lovely herbs have gone crazy and are now at that wonderful, lush growing stage where the more they are pruned, the faster and more vigorously they grow. 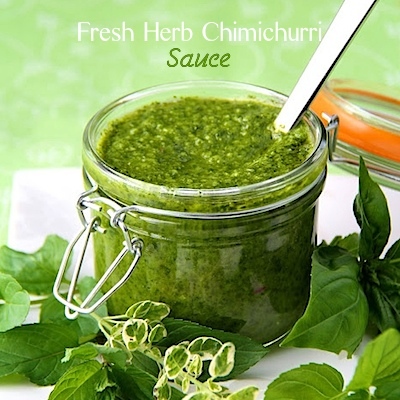 I knew I would have to make something delightful and fresh this weekend with my newly acquired treasure trove of herbs……….. chimichurri! If you’re not familiar with chimichurri you’ll be thrilled with this new friend. 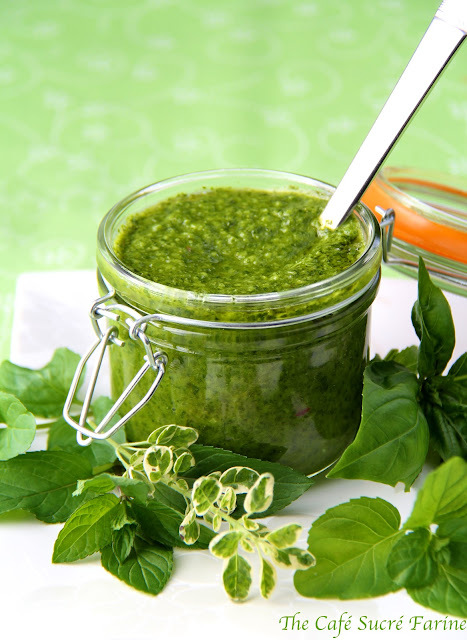 Chimichurri is a sauce that’s frequently served with grilled meat in Argentina. The traditional ingredients are garlic, parsley, oregano, lemon, olive oil and wine vinegar. There are many legends regarding the origins of this delicious sauce, but no one seems to know for sure how it got it’s funny name. I like to think of it as the Argentinian version of pesto. I decided to take a bit of liberty with the traditional recipe and combine a variety of my bountiful herbs. I used basil, cilantro, parsley and mint along with fresh lemon zest and juice plus a bit of white balsamic vinegar. We loved the final results. It’s fantastic on grilled meats, adding a zesty freshness AND it makes a lovely and delicious appetizer. 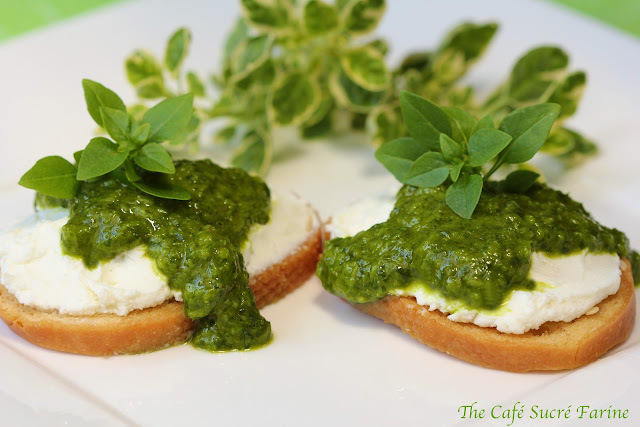 I spread crostini (you could use any type of cracker) with goat cheese (cream cheese would also be wonderful) and drizzled it with the vibrant chimichurri. You could also serve it as a dipping sauce for warm bread, steamed shrimp or with crudités (raw veggies).The gorgeous bright green color adds visual appeal to everything you serve it with. I think you’ll be getting requests for this one again and again! 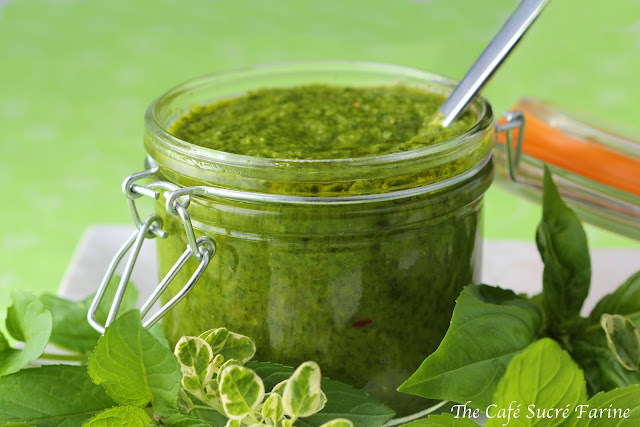 Combine all ingredients in a food processor and puree until combined and fairly smooth. Leave just a bit of texture. Transfer to a storage container and keep cold until ready to use. Remove from refrigerator about 30 minutes before serving. If serving as a dip, drizzle with a bit of olive oil. 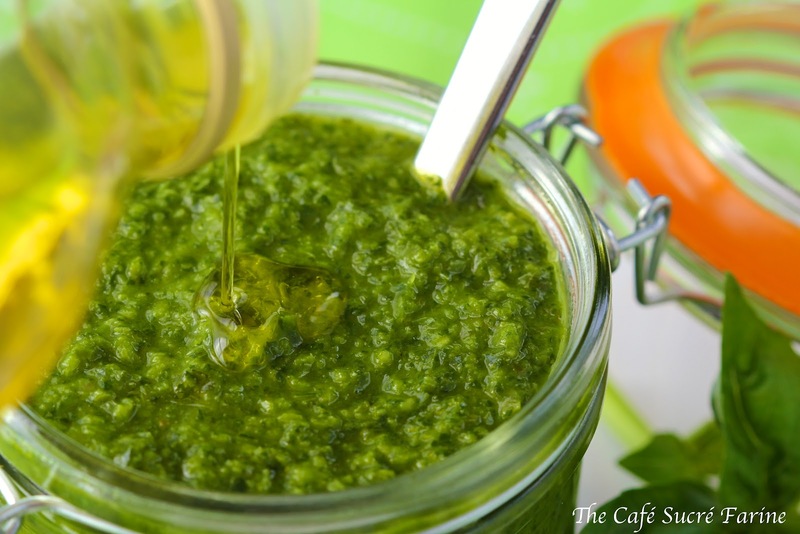 Yumola, I’ve come across chimichurri sauce way to many times not to have tried it. I can almost smell the freshness of yours. Cathy, I have never frozen Chimichurri but I freeze pesto all the time so I think it would be fine. I think it lasts a bit longer than regular pesto due to the lemon juice and vinegar. the name is really cute and sounds like a kind of dog’s breed. Love how you described them and love their vibrant green! I am imagining all kinds of ways to use this wonderful sauce, Chris. I bet it would be delicious on grilled halibut or salmon. Is it less perishable than traditional basil pesto. Have you tried freezing it? I wish my garden had gone crazy with growth while we were gone! Instead, the drought took its toll, but I think a little watering will revive my plantings. Your chimichurri looks fabulous…I’ve never made it, but it would be perfect with all the grilled meats we eat in the summer. Hope you had a wonderful vacation, Chris! Looks wonderful, Chris. There’s a woman who sells this at out Farmers’ Market, but it’s way too garlicky. I like your fresh version & can think of so many things it would be great on – fish, pasta…yum! hehe! so true Kim, you make me laugh! With gardens, that’s always what happens when we left!!!! It’S like plant are telling themselves: go!!!!! she’s gone, we’re having a party (just like teenagers)!!!!! don’t you think????? I love chimichirri sauce, it’s so good on fish too!! Plus, on a croûton, with goat cheese, yum!!!! I actually like the blend of ingredients you’ve used better than the traditional sauce plus it’s a nice brighter green. I wish I had a garden. I’ve never had much of a green thumb and since we travel for extended periods of time I’d be concerned they’d all die, so why bother. But I do wish I had one. It would make cooking even more enjoyable being able to use fresh herbs from the garden. I’m jealous! Lovely herbs! My herbs are also going crazy. The sauce is an excellent idea…I have everything but cilantro. Once it gets warm, my cilantro doesn’t do well. Welcome home!!! 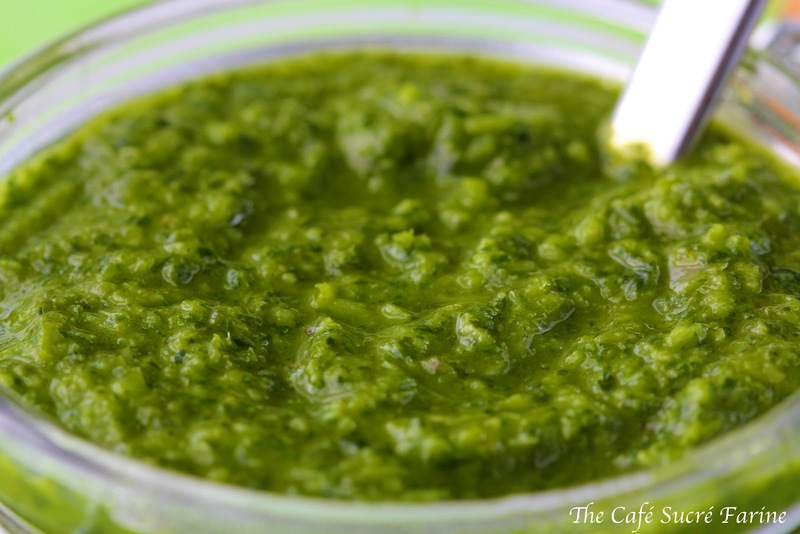 I love herbs and I can see so many uses for this sauce. When I get home form work, I am going to pick my herbs from my garden and make this. Thank you!! What a wonderful surprise to come home to. It’s always touch and go with my garden. I could come home to it flourishing or the complete opposite! This looks like a delicious way to use your herbs. I love sauces, I´m going to try it this one. Perfect food presentation. This is one of my very favorite things! Welcome home and I’m so glad that you had a wonderful time with your family. The flavors must just burst in your mouth! You are either thinking ahead, or you know that I am one to ask questions! Because I was for sure going to ask you about the funny name! Sounds like something that Mary Poppins would snack on. How wonderful to spend 2 weeks in the UK with your daughter and how wonderful to discover you have a herb jungle! Chimichurri is just so fabulous and your recipe sounds SO delicious – can’t wait to try this 🙂 and welcome home! I wondered how your garden would fare in your absence. Nice to hear that all is well. This sauce looks amazing. The photos really come alive! This sounds amazing! I am bookmarking it! oooh sounds so fresh and delicious! love that color!